Murray Siple snowboarded down British Columbia’s Whistler Blackcomb in the 1980s in the earliest days of the sport and traveled the world making films documenting snowboarding and other extreme sports. After a terrible car accident resulted in quadriplegia, he did not pick up a video camera for eight years. 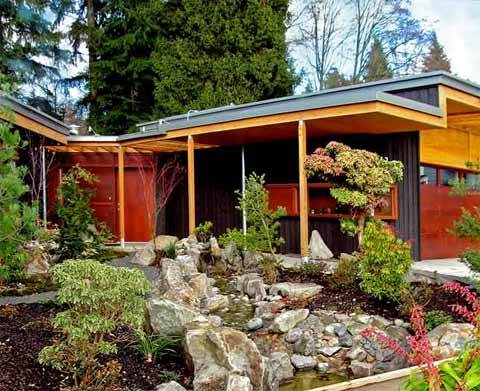 This case study is the story of Murray realizing a vision for a home that would minimize his limitations, allow him complete independence and provide the kind of space where he could pick up his creative life again. Working with Acton, Ostry Architects of Vancouver, this is the story of a gut renovation and addition to a 3000 square foot [278.7 square meters] tired mid-1950s two bedroom ranch transformed into an updated modernist treasure located on a wooded stream with views of downtown Vancouver. Murray Siple knew what he wanted when he sought out the place that would become his home and film editing studio. It needed to feel like it was in the forest with views of nature on every side but the house also had to be on a level grade to avoid the need for ramps. Though he wanted tolive there without the need for personal care assistance despite being paralyzed from the waist down, he also insisted that it be beautiful, even dramatic, and not include any features that communicated that it was ‘special.’ Acton Ostry Architects worked very collaboratively with Murray to realize the vision. Murray found the property after a year’s search. The site and shell were exactly right but nothing about the configuration of space or relationship to the landscape worked. Acton Ostry had the original 2400 square foot average ranch taken down to the studs and added a 600 square foot addition resulting in an L-shaped space. Indoor space was transformed to include extensive use of glass and wood. Baffled-wood skylights bring not only light but also images of the tree canopy into the rooms. New large windows were cut to frame views, some extending to the floor, with deep recesses lined in wood. There are no seams or thresholds. Cherry floors predominate and commercial grade carpets were inset into the floors to eliminate level changes. Outdoors, a wide slightly inclined concrete walkway leads to the house. Very wide terraces with a deeply extended wooden roof create external space for entertaining or to host visits clearly visible through the large windows by local wildlife including the occasional bear. The angled line of the terrace creates two sides of a front garden deeply layered with local plants enjoyed from the slightly higher place of the terraces. Color image shows the garden before the Siple House, which includes native plantings and rock arrangements. A concrete path leads to the wood-faced home and the adjacent outdoor terrace with overhang. Color image shows Siple pushing open one of the wide sliding doors from the interior of his home. With their low thresholds, these doors allow for easy transitions between the indoors and outdoors. The ‘after’ floor plan shows the expansion of the house by 600 square feet, the opening up of the floor plan and the integration of the interior with the exterior plan. Color image shows Siple in his kitchen cooking over a stove top with ample kick space beneath it. Other kitchen appliances and tools, including a microwave, rest on the stainless steel countertop and are all placed within arm's reach. A window at counter height provides Siple with natural light while he cooks. Color Image of Siple in the kitchen, filling a mug from the built in coffee and hot water dispenser set in a cabinet. Everyday kitchen customs are made easier by the openness of this space and the conveniently placed cabinetry. Colored image shows diagonal view of the living room and kitchen at night. In the background, the wide, sliding glass doors have been opened, thus extending the living room to the outdoors. Visible in the bottom right corner is a tiled fireplace. Colored image shows Siple in a roll-in, open shower room. A large white tub is visible to the left and beside it in the foreground is a long rectangular floor drain. Color image shows a large, deep, single pane window with a simple desk table surface in front. The window extends to the floor and frames a wooded scene outdoors. Color image shows Siple in front of a lavatory with custom built-in cabinets. Mirrors, cabinets, drawers, even a wall-mounted flat screen, are all in easy reach. A wood-framed skylight is above. Color image shows a light, simple desk and red chair with casters in front of 90-degree angle glass wall looking out to the forest. Computer Assisted Design rendering of the topography of the Siple site, which slopes westwards towards Mosquito Creek Park. Identified on the plan is the main house, garage, studio, lap pool, terrace, and paths. Colored rendering depicts the Siple house façade in relationship to the deep and sloped forest on the left; window and doors with views to the outdoors repeat the forest greenery. Computer Assisted Design rendering of the South Elevation of the Siple renovated residence and parcel with lap pool visible on the left. Color image is a nighttime-shot of both the exterior terrace and interior. In the foreground is greenery, followed by the seamless concrete floor below the terrace overhang. Inside, the living room and kitchen are visible behind the wide, sliding glass doors, some of which are open. The entire process from idea through construction took two years. Since the site wasn’t even located until a year into the process, Murray was temporarily living in the area in a nearby house slated to be town down. It provided an ideal ‘lab’ for the designers to observe Murray going all of the tasks of daily life. Since there was no need to keep the house in good condition, Murray and his design partners tried all kinds of solutions to see what Murray could do and what design solutions could work. They knew exactly how much height his feet needed below cabinets and what faucet angle would give him the best access. It proved a hard-to-replicate but ideal test bed for ideas that would define the new house. Dialogue was extensive and ongoing, both visually and verbally. The intimate and meticulous analysis of function was a rare learning opportunity for client and designer. Throughout the process, Siple would respond to the architect’s plan and elevation drawings while providing sketches of his own. Every element of the house was analyzed to find not just the accessible solutions but a seamless integration of features that would be attractive, easy to use and reflect Murray’s lifestyle. Every activity of daily living was analyzed to determine how the physical environment could facilitate what Murray needed and wanted to do. As an example of unusual attention to commonly overlooked opportunities, the designers realized that they should pay attention to the ceiling surfaces because Murray was always looking up to have a conversation with a standing visitor. Millwork details deliver enhanced usability but don’t stand out as more than sophisticated style. Touch latch doors open all cabinets; pull-out shelves make transfer of hot oven items safe and easy; a pot-filler faucet takes care of water at the stove. Full extension drawers and other cabinet fittings make access easy and flexible. Murray can make expert espresso independently at a built-in counter set-up. Murray Siple is an unusual client, clear about what he wants and driven to figure out how to get it through an unusually committed and nimble design team. The home clearly works. Murray lives with no more help that most of his neighbors – someone comes to clean once a week. The home has restored Murray’s freedom to pursue the life he wants. Perhaps most telling as a measure of the success of the project is Murray’s return to his life as a gutsy documentary film maker, editing in his home studio. In 2008, he finished ‘Carts of Darkness,’ a feature-length documentary about a group of homeless men who use grocery carts part of the day to gather bottles to turn in for money and then turn the carts to the steep hills of North Vancouver and use them as downhill racers. The film has won a Leo Awards (BC’s awards for film excellence) and five other nominations. He is slated to premier his documentary ‘Sit On It’ about a world champion site skier at the 2010 Winter Olympics in Vancouver that will take place at Whistler, the site of his early adventures in snow boarding. One story open floor plan. No thresholds or level changes. Wide, level and sheltered exterior routes. Hardwood floors with recessed carpeting. Cabinets and appliances designed with maximum flexibility and easy reach. Spacious kitchen and living open space of easy entertaining. Lowered bedroom closet with sliding doors. All-tile shower with a wide level floor drain. Windows designed to maximize views whether seated or standing. Raised kick spaces at millwork to allow wheelchair to go beneath. Faucet above stove to avoid transferring heavy pots from sink and up onto stovetop. Pull-out millwork shelving at microwave. Added insulation and under-floor hydronic (radiant) heating system. Slow flowing site drainage directed to nearby creek. Indigenous planting to stabilize bank of nearby creek.